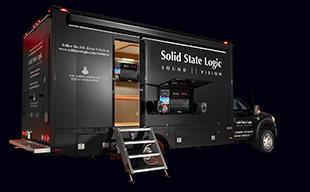 “It was a difficult process, but in the end the deciding factor was sound quality. We chose the L500"
South Korea - Bethel Church , IllSan, South Korea, has invested in a new SSL L500 Plus live console and SSL stageboxes for Front of House duties. The system was supplied and installed by South Korean SSL Distributor HANSEO Broadcast & Music Tech Inc.
Bethel Christian Church has two Chapels, one in Ilsan and one in Paju, NorthWest Seoul. The Bethel Church Pastor travels between the two, delivering a sermon from one, which is transmitted live to the other. Daily attendance at the Church is 8,000 - 10,000 people, with six services on a Sunday and a total congregation of around 20,000 people. The input channel count on a typical service at Bethel Church is 64, with drum kit, bass, two guitars, keyboards, piano, orchestra, choir, soloist, and Pastor from stage. These go from SSL SuperAnalogue stageboxes, through the SSL BL II.D Blacklight II MADI Concentrator, and to Front Of House via a redundant optical pair. The console itself has an additional touch screen connected, as well as the SSL SOLSA online/offline control PC application. He also notes remote control as another aspect, as there is no dedicated monitor position at the Church. "It's a big church, but we operate with only a few staff," he explains. "Except for Sunday worship, we often work shifts alone, which was very difficult with the analogue console - continuously moving from stage to the Front of House to check monitors. Now we can easily adjust the monitor balance on stage with SSL’s TaCo – the remote tablet application."